Despite some problems, the Italian food sector benefits from its non-cyclical nature, its large and varied client base and a strong export performance. The food sector is one of the most important industries in Italy, employing around 400,000 people and with a total turnover of more than EUR 130 billion in 2013. The sector is affected by the downbeat economic situation in Italy, with low private consumption and depressed confidence putting pressure on prices and margins. It also suffers from structural weaknesses including high fragmentation, poor profits, low earning retention and a modest equity base. However, the Italian food industry also benefits from a generally non-cyclical nature and the ‘Made in Italy’ cachet that boosts export growth, which we expect to be confirmed both in 2014 and in 2015. Production increased in 2014 and expectations for 2015 remain positive, thanks to rising export orders and higher domestic consumption, mainly of butter and powdered milk. However, dairy producers’ margins remain under pressure, as the lower costs of raw materials have been counteracted by higher energy and transport costs, fierce competition and the repercussions of the Russian import embargo. The outlook for cereal indicates an above average 2014 harvest, for the second year in a row, and the subsector has seen record exports in 2014. However, despite strong global demand, ready availability has led to lower prices. Margins are however expected to improve in 2014 and 2015. In recent years production has decreased in many European countries: markedly so in Italy. The trend is expected to change in 2014 and 2015 because of the effects of cow restocking. Italian consumption of beef is currently low because of changing food habits and consumer price sensitivity. Exports have also been hit by the Russian food embargo. Lower consumption, higher costs and constraints on the ability to raise prices are all impinging on margins. The food retail sector generally maintains its anti-cyclical strengths. 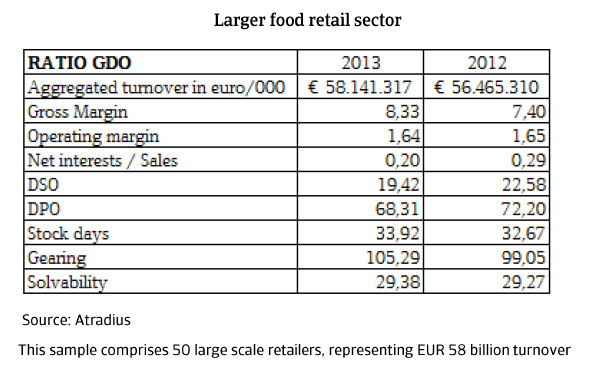 However, food sales in Italy have decreased throughout 2014 and domestic orders are expected to remain modest in 2015. Add to this the strong competition in the market and margins will remain under pressure. As in other Italian industries, food businesses are often poorly capitalised. With their market power, larger food retailers and producers are generally faring better than smaller firms in a highly fragmented market. The larger operators maintain a reasonable level of liquidity while many small to medium-sized companies, with poor bargaining power, low profits, a modest equity base, poor cash flow generation and heavy investments in working capital, are experiencing some problems. Opportunities to increase leverage on suppliers to improve operating cash flow are limited. Since October 2012 a new law (‘Article 62’) lays down a maximum payment term in the food sector of 30 days for perishable goods and 60 days for non-perishable goods. As a result, the weakest food companies, unable to cope with the gap between their working capital requirements and payment obligations, have left the market or have had to reorganise their operations. However, others have managed to comply with the law and consolidate their strength. We expect this law to release further liquidity in the Italian food value chain and help to improve international competitiveness. In large scale retail, payment behaviour has improved slightly in the last couple of months, while some deterioration can be seen in the medium-sized distributor segment. In general we expect payment delays to continue to decrease in the coming months. Insolvencies are expected to remain stable for the same period after a worsening trend over the last six months. In recent years many small and medium-sized food retailers have struggled financially. 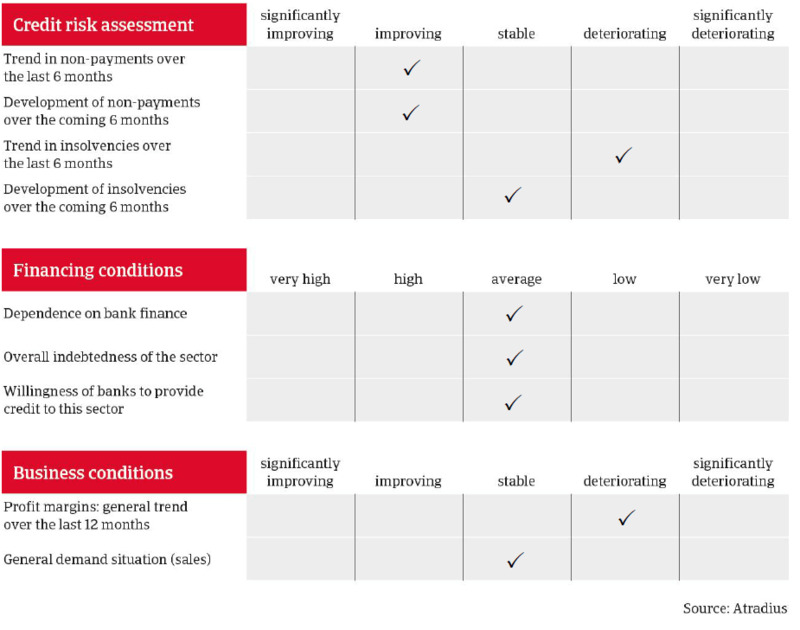 Common issues have included the quality of their credits, stock levels, weak associated companies, slow payment habits, and the lack of sufficient liquidity to meet ‘Article 62’. In contrast, large scale retailers have seen a decreasing insolvency ratio. In the current uncertain environment, performance will depend mainly on management skills, good credit management and a focus on core business to generate enough cash to reinvest in the company. Demand is expected to remain stable for the food industry, for both private labels and brands with perceived added value. Despite its problems, the sector can benefit from its anti-cyclical nature, its large and varied client base and strong export performance. This means that we have a generally open underwriting approach to this sector: of course always depending on buyers’ financial standing. B2B payment defaults in Western Europe remain significant. This is expected to slow the still weak economic recovery, particularly of the Eurozone, and keep insolvency rates well above 2007 levels. Italian GDP is expected to grow after three years of contraction. Domestic demand is forecast to stabilise as investments and household consumption are expected to accelerate.